High school sports are often very demanding and since high schoolers are still growing they tend to be injured in different ways. Some of the most common injuries among young athletes include sprains, strains, growth plate injuries, repetitive motion injuries and heat-related illness. Girls are most likely to experience athletic injuries in gymnastics while boys are most likely to experience athletic injuries while playing football, soccer, and basketball. Given that teen athletes can be more vulnerable to injury and overuse than adults, it makes sense to offer them the same opportunity for healing and pain relief. TRI researcher Maria Hernandes-Reif, Ph.D., says that one of the consistent findings in studies of the benefits of massage therapy is a reduction in stress and the stress hormone levels. “There is a relationship between stress and the immune system. If stress hormones are chronically elevated, the hormone cortisol will destroy the healthy immune cells that fight viruses and tumors and keep the immune system healthy. If you can reverse that, you not only reduce stress but also reduce stress hormones, allowing the immune system to bounce back and do its job, which is to heal the body and keep it healthy. As a teenager menstrual discomfort can be difficult to cope with. Massage therapy is known to be one of the best ways by which cramps can be kept under control or stopped completely. Girls can also benefit from learning self-massage techniques to use when experiencing menstrual cramps on a day-to-day basis. According to the National Institute of Mental Health, 3% of American teens suffer from an eating disorder, and the majority of them go untreated. Depression, social pressures regarding appearance, and participation in sports where leanness is valued such as gymnastics, ballet, diving, and wrestling are all associated with the development of eating disorders. Studies done at the Touch Research Institute with women who struggled with either anorexia nervosa or bulimia showed that regular massage decreased anxiety level, increased levels of the feel-good hormone dopamine, and reduced depression. Participants in the study also showed better scores on the Eating Disorder Inventory, indicating better body awareness. While counseling is critical in treating people with eating disorders massage therapy can be a powerful adjunct to other forms of treatment. 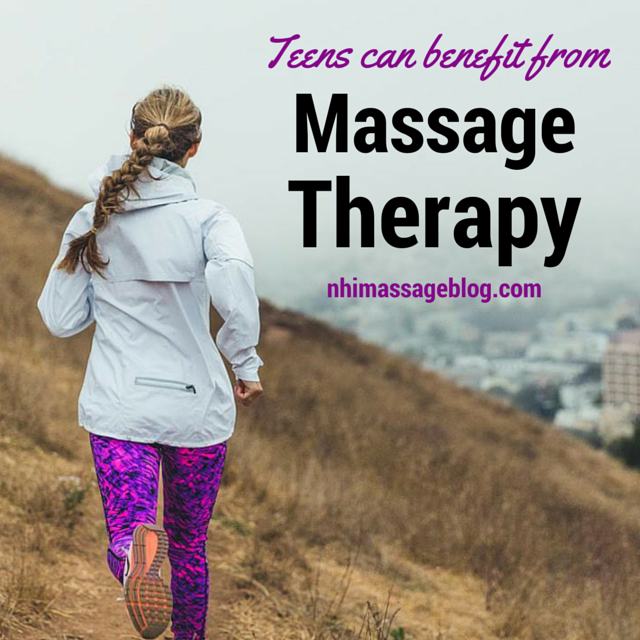 Do you know a teen who could use a massage? Book an appointment at our student ran clinic – we have seven California locations with affordable prices so that teenagers in in our communities can make massage a regular part of their healthy lifestyle.